By the hundreds, classmates of the 19-year-old-detained student, identified as Dennis Rivera-Sarmiento, displayed signs to show solidarity. A press release from the student body said Dennis was racially profiled by another student he did not know, bullied and called names because he is an undocumented immigrant. "Because of troubling Houston Independent School District (HISD) policies when Dennis, a beloved student and athlete, reported this harassment, he was taken into HISD police custody and transferred to Harris County jail by a Sheriff (sic). "Because Harris County jail voluntarily assists Immigration and Customs Enforcement (ICE), when Dennis was booked into custody, his fingerprints were immediately shared with ICE and an ICE hold was issued against Dennis. Despite paying his bond, Harris County chose to keep Dennis and he was picked up by ICE agents and moved over 40 miles away from his friends, family and attorney," the release said. 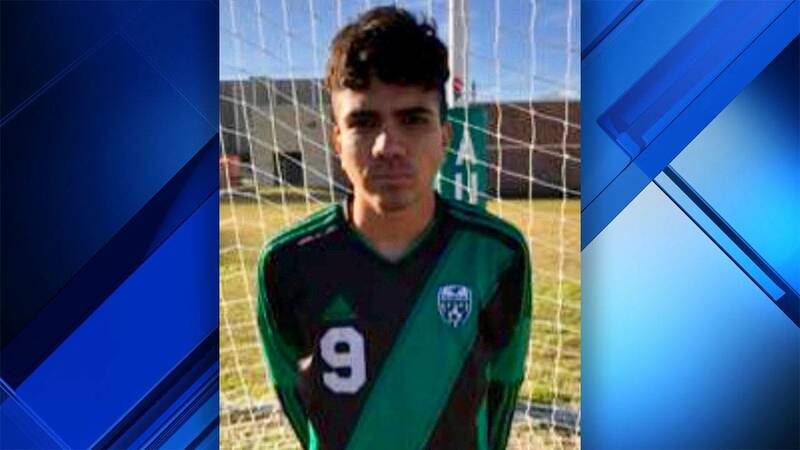 Rivera-Sarmiento's lawyer told KPRC the student had thrown an open bottle at him and called him a racial slur regarding his immigration status. Rivera-Sarmiento then pushed that student, according to his lawyer. His lawyer is now looking for legal options for his release. It was a student led rally and march. Student organizers told KPRC they had been planning it since Monday, walking into classrooms to spread the word. "I'm trying to support the dream act and I'm trying to help people who are getting deported," said Rivera-Sarmiento's friend since middle school, Yasmin Vienna. Hundreds of students crowded entire streets, holding signs. "He was nice. He did everything for his education...It not only effects him, it affects all immigrants," said Vienna. ICE said the student should have left on or before March 5, 2014. "On Jan. 31, 2018, deportation officers with U.S. Immigration and Customs Enforcement (ICE) lodged an immigration detainer with the Harris County (Texas) Sheriff’s Office Jail on Dennis Raynel Rivera-Sarmiento, 19, a citizen of Honduras, following his arrest on criminal charges of assault causing bodily injury. That same day, the jail released him into ICE custody. Rivera-Sarmiento was issued an expedited order of removal in March 2013 when he was encountered by immigration authorities after illegally entering the United States. He was released on an order of supervision, and last reported into ICE on Oct. 7, 2013. He was supposed to depart the country on or before March 5, 2014. ICE has had no further contact with Rivera until his Jan. 31 arrest." "The pressing questions was whether ICE officials were here called on campus. They were not," said HISD Board of Trustee member Dr. Sergio Lira. "The student committed a serious offense, according to our code of student conduct. He was cited for assault. Therefore, he was transported to Harris County, and their ICE officials took over. We have no control of that." Lira said the students would be marked as absent. United We Dream, a community advocacy group, said the system needs change. "Schools need to make schools safer for all students. There should be no reason for HISD police to arrest students where they will be sent to county jails and sent to deportation centers," said Damaris Gonzalez with United We Dream. "I don't think that what happened should have been taken to the extreme of charging someone for defending themselves and putting a child in detention," said Sema Hernandez, a concerned community member. The Harris County Sheriff’s Office’s top priority is ensuring the safety of all residents, including members of the immigrant community. In February 2017, the Harris County Sheriff’s Office terminated its voluntary 287(g) agreement with U.S. Immigration and Customs Enforcement. By terminating that agreement, Sheriff’s Office employees are no longer deputized by ICE to investigate the residency status of criminal suspects booked into the county jail. Ending the 287(g) program in Harris County freed up 10 Sheriff’s Office employees who were previously assigned to the program so that those resources could be focused on enhancing public safety. Texas Senate Bill 4, which was signed into law by the governor in 2017, requires local law enforcement agencies to cooperate with federal agents enforcing immigration law. Sheriffs, constables and police chiefs who do not cooperate with federal immigration law enforcement officials a re subject to civil penalties under SB4. In compliance with state law, the Harris County Sheriff’s Office grants ICE agents access to criminal suspects after they have been charged with a crime and booked into the county jail. Although SB4 is the subject of an ongoing legal challenge, the Harris County Sheriff’s Office is bound to comply with the law as it currently stands.